A very solidly built windmill with a heavy main casting for its size. The colour shown is to a large part guess work. Grey was the colour left on the gear box, but also snippets of red were on some of the fittings. Remnants of red were on the hub sections. The manufacturer's colours were usually red and yellow on other implements. It was made by the STATE IMPLEMENT & ENGINEERING WORKS at Rocky Bay, North Fremantle, Western Australia. 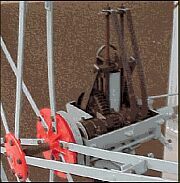 The design used floating main gears, large roller bearings on the hub shaft, an oil pump built into the main casting and a compression band hub brake. Elements of the earlier BOOMERANG windmills appear in the parts for the tower, hub and fan. The design appears to have only been available in an eight foot fan configuration.